A Bird Hunter's Thoughts: Tritronics Alert!!! I'm learning the hard way, again. 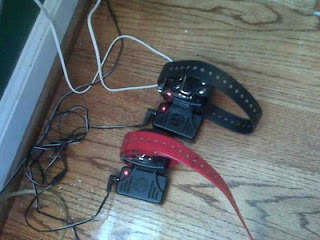 If you have one of the new Tritronics Collars- KEEP THE THINGS IN THE CHARGERS ALL THE TIME WHEN NOT IN USE!!!!! If you do not, and I did not, the range will start to decrease until it is unusable. Then you'll be calling about the range issue and they will either, 1) tell you to send it back right before you leave on a hunting trip, or 2) tell you to read the instructions and keep the collars charged in the cradle at all times and then give you a procedure to fix the problem. Don't take my word for it- call 800-456-4343 and ask tech support about the range and battery issue. I talked to a lady that sounds like a Yankee (wish I'd gotten her name) and she was all over the issue and knew what she was talking about.